A team of astronomers has used a massive galaxy cluster as a cosmic magnifying lens to study the nature of dark energy for the first time. When combined with existing techniques, their results significantly improve current measurements of the mass and energy content of the universe. The findings appeared in the August 20 issue of the journal Science. Astronomers employ a number of methods to study the geometry of the universe, which tells us something about the nature of dark energy—a mysterious force discovered in 1998 that speeds up the expansion of the universe, but about which little else is known. Uncovering the nature of dark energy, which makes up about 72 percent of all the mass and energy in the universe and will ultimately determine its fate, is one of the holy grails of modern-day cosmology. Now an international team including Yale University cosmologist Priyamvada Natarajan has used gravitational lensing to learn more about this elusive force. 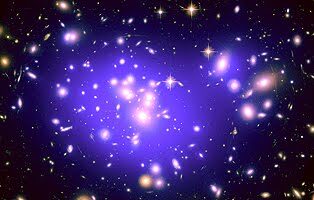 Using data taken by the Hubble Space Telescope as well as ground-based telescopes, the team analyzed images of 34 extremely distant galaxies situated behind Abell 1689, one of the biggest and most massive known galaxy clusters in the universe. Through the gravitational “lens” of Abell 1689, astronomers were able to detect the faint, distant background galaxies—whose light was bent and projected by the cluster’s massive gravitational pull—in a similar way that the lens of a magnifying lens distorts an object’s image. The way in which the images were distorted gave the astronomers clues as to the geometry of the space that lies between the Earth, the cluster and the distant galaxies. “The content, geometry and fate of the universe are linked, so if you can constrain two of those things, you learn something about the third,” Natarajan said. Using theoretical models of the distribution of both ordinary and dark matter in space, Natarajan and the team were able to narrow the range of current estimates about dark energy’s effect on the universe, denoted by the value w, by 30 percent. The team combined their new technique with other methods, including using supernovae, X-ray galaxy clusters and data from the Wilkinson Microwave Anisotropy Probe (WMAP) spacecraft, to constrain the value for w.
The result confirms previous findings that the nature of dark energy likely corresponds to a flat universe. In this scenario, the expansion of the universe will continue to accelerate and the universe will expand forever.